This WWW-page contains two short videos concerning the once existing proto-planetary disc in the Solar System. Dybczynski P.A., Leto G., Jakubik M., Paulech T., Neslusan L.: 2008, "The simulation of the outer Oort cloud formation. The first giga-year of the evolution", Astronomy and Astrophysics, submitted. Leto G., Jakubik M., Paulech T., Neslusan L., Dybczynski P.A. 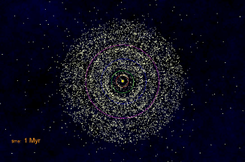 : 2008, "The structure of the inner Oort cloud from the simulation of its formation for two giga-years", in preparation.